Scandinavian Airlines – SAS, which celebrates its 70th anniversary this year, has been focused on bringing innovation to its passengers since 1946. With a passion and vision to ‘make life easier’ for Scandinavia’s frequent flyers, SAS is making investments of MSEK 500 across its entire short and medium haul fleet – from installing the fastest WiFi in Europe to completing a full cabin upgrade. By partnering with ViaSat, SAS can offer onboard speeds of 12 Mbps and higher to each passenger, ensuring time spent onboard will be more productive and more enjoyable with streaming TV, music and movies. “Many of our customers are frequent flyers and we play an important part in the lives of many people. The upgrade we implemented on our long haul aircraft gained a very positive reception and we are now upgrading our short and medium haul fleet, which will also include high-speed WiFi with speeds that enable time onboard to be utilized for work or to relax and enjoy a streamed movie or TV series. As both passengers and crew onboard are now connected, we can take our personal service to greater heights while continuing to develop our digital, smart solutions that make life easier,” says Rickard Gustafson, President and CEO of SAS. 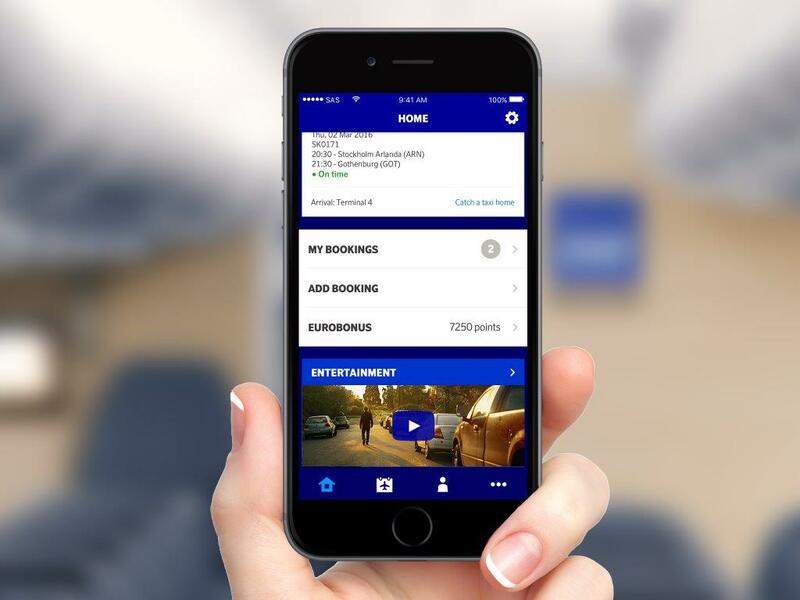 SAS is committed to delivering seamless WiFi travel experiences where passengers can access all of their content and information from anywhere: at home, at the airport or onboard. The new onboard high-speed WiFi service gives passenger’s gate-to-gate internet access with the fastest speed available on the market. In addition to streaming, social media and traditional workplace applications, passengers can also expect to get better assistance from the cabin crew, which have been recently equipped with iPad Minis that will be connected to the WiFi system. With new high-speed WiFi capabilities SAS crew will be able to access flight and passenger information – before take-off, during the flight and after the flight lands. This includes helping passengers check if their flight is on time to the status of connecting flights, check their EuroBonus account or even book a EuroBonus flight, shop in the EuroBonus store, rent a car, book a taxi to meet them at the airport or even tell SAS crew members what they thought of the service – all while onboard. The first aircraft with the new WiFi-system will enter service in the second half of 2017. Onboard WiFi will be free on short haul flights for all SAS EuroBonus members and SAS Plus ticket holders. “In working with SAS, we are making the internet accessible, fast and easy-to-use at 35,000 feet. Only by coupling the ViaSat end-to-end service platform with Eutelsat’s European satellite connectivity, can we enable airlines, like SAS, to offer a best-in-class onboard WiFi service in Europe for free to EuroBonus-members and SAS Plus passengers”, says Mark Dankberg, chairman and CEO, ViaSat. The first aircraft with the refreshed cabin interior will be SAS’s new A320neo, which in addition to extra leg room, new and more comfortable seats, a lighting system that aligns with the time of day and USB outlets at seats to keep personal devices charged, will also offer 15-20% lower fuel consumption. The interior design is in line with the new cabin offered on SAS long haul routes, which was launched in 2015. The new interior quickly became very popular with both Scandinavian and international customers. In addition to 30 new A320s, 70 existing cabins will also be upgraded between 2017 and mid-2019. The WiFi onboard and cabin upgrades are expected to amount to a total investment of approximately MSEK 500 over a three year period.